My second Gossip Girl post of the day! She is the master behind the website and the girl with eyes seemingly everywhere around the big city. Since the series began in 2007, I gave up on guessing which character would be revealed as the mastermind. However, I've always maintained that Gossip Girl would be a girl and someone linked to the main cast. Serena and Georgina were revealed to be accomplices last season and subsequently could not be the title character. Little J might be a strange choice to start off the list, being that she is a (former) main character. Her rebellious antics played an ongoing role on Gossip Girl's website, even contributing a few tips, and it did spark a few blog wars between herself and Blair. While today I did mull over the idea of her being the villain, chances are that Jenny isn't Gossip Girl. She abandoned the city in Season 4 during both the Blair and Juliet incidents and then she jetted off to university with Eric. 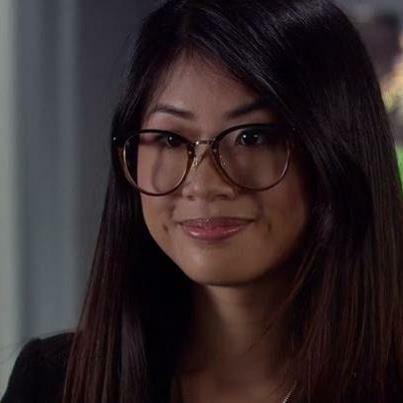 If she were to secretly be the central character, I assume her international schooling might be the reason why Georgina took over the temporary role. Juliet may have disappeared since her Season 4 recurring appearance; however, she could still be Gossip Girl. Her vengeful nature originated before she interacted with any of the main characters and the mysterious blogger was exceptionally cruel to Serena in high school. Plus, Juliet is set to return to the finale and it could be her character's revelation moment. The one instance which works against the theory is a text message sent to Blair when they asked Gossip Girl to help find Juliet (yep... I did my research). The text didn't directly lead to finding Juliet but it puts a wrench in theory. Never trust a disgruntled former minion. While the final season has brought back many former characters, Nelly Yuki has earned the most screen time. The early seasons saw Nelly as a lowly minion to Blair who was delegated to the bottom of the group before "stealing" Blair's Yale acceptance. She came back as a fashion writer and I realized that we never knew what Nelly studied in school. She could have used the blog as training to develop her writing skills and connections to get a great job right out of school. It sounds like a stretch but Blair's been dealt the worst of Gossip Girl's wrath while Dan (whom Nelly has a crush on) usually gets the least amount of negative posts. The only reason Dorota is on this list is because I thought she was Gossip Girl in the first two seasons. Blair, and also Serena, continually receive the most Gossip Girl blasts. Tips from strangers helped to provide the stories but some of the stories had to have been leaked from someone close. Dorota was always lurking around and could have secretly been the elusive blogger. However, my thinking has shifted over the seasons as Dorota has proven to really care about Blair and wouldn't create 95% of the posts Gossip Girl does. I've held on to the theory so far and I can keep it going for one last episode. There is no way that Kristen Bell is Gossip Girl. She has an upcoming cameo role in the series finale and has never appeared as a character on the show. I have a running joke with a friend that Kristen will be revealed as Gossip Girl with flashback highlights to explain how she knew everything. She's only on the list because no matter who is revealed tonight, Kristen and her voice-over as the narrator will always be a reminder of Gossip Girl to me. Do you agree or disagree with my guesses? Sound off in the comments and let me know your Gossip Girl predictions.